We’re finally here. Open inspections on our farm next Sunday, and our agent thinks our home will sell like lightning. It’s been a long road. When we first bought our farm eight years ago, I never imagined ever leaving. I think nobody ever expects to leave a new home, do they? It’s been a terrific home too. Our children have grown from being tiny (son 4 and daughter 2) to being strapping young people on the verge of being teens. I’m fully expecting our son to shoot past me in height over the coming year, and our daughter to do the same in the next two or three years. They’ve grown up here, and we’ve all been very happy. But it is time to move on. We’re staying in Dunedin. After the sale goes through, we’ll know what money we have to buy a new place, and we’ll start looking seriously then. The house is so clean and tidy now, it feels like all we’ll have to do is move our furniture once we have a sale confirmed. One of the benefits of being a minimalist, I guess, is that you don’t have that much stuff. I do feel a little like our furniture should maybe be fancier or newer – so many of the houses on the market seem to have “new everything” that I can’t help wondering how much debt their owners have! By comparison, the newest piece of furniture we own is our sofa, which is nine years old. We keep things forever! I do believe we’ll make a great sale. Our views are spectacular and this is a truly special part of the land that we’re on. They’re not making any more land, and there are very few lifestyle farms like ours, fewer still on the market. Demand is high, and we hope that someone will fall in love with our farm, just as we did all those years ago. We’re also fortunate to have a great agent who has been with us every step of the way, and who I hope will guide us to a great conclusion. 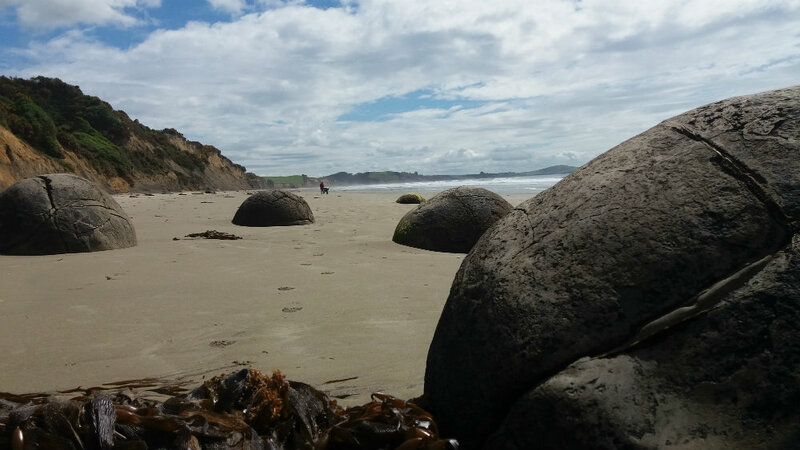 Moeraki boulders…a brief respite from selling a home!